1) I’m in Baltimore/DC now for the final rehearsals and the premiere, on Monday, November 19th, at the Kennedy Center’s Terrace Theatre, of the one-act opera “A Game of Hearts,” with music by Douglas Pew and words by your correspondent. Longtime SOSers know this piece to be one of three twenty-minute operas commissioned by the Kennedy Center / Washington National Opera as part of the first year of the American Opera Initiative. 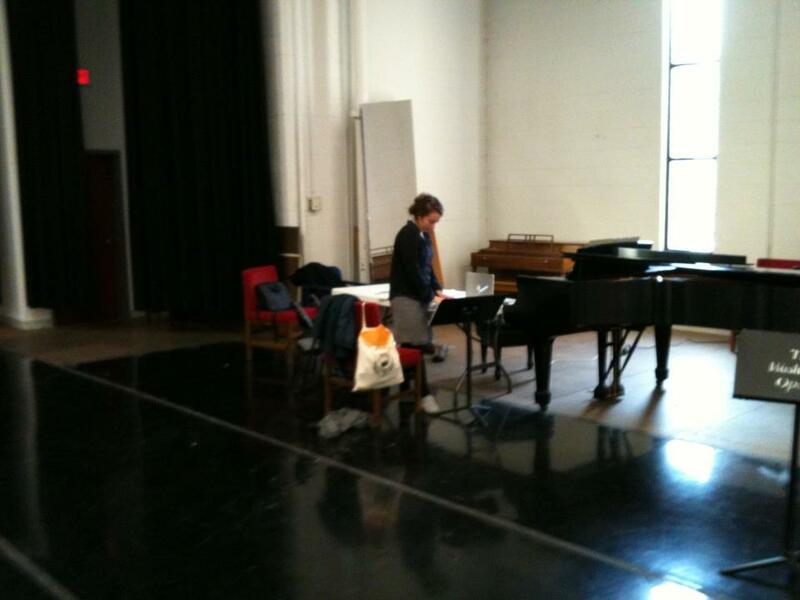 In the WNO’s rehearsal room for a day of rewrites; photo by Mr. Pew. Monday’s reading is Sold to the Out, but if you missed it this round, it has also been programmed by Cincinnati’s NANOWorks for the spring of 2013. Myself and Mr. Pew. 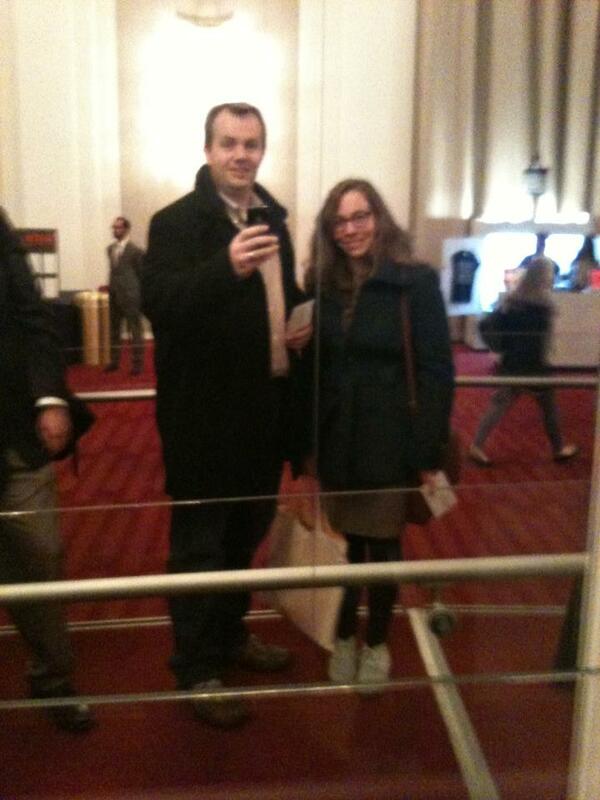 Not for nothing do they call it “opera”–it often takes place near big shiny mirrors! 2) Shortly after said operaticness, upon returning to Polska, a very unfinished “pokaz” (showing) of everybody’s favorite Ancient Greek Mash-Up That Wouldn’t Die, To Die In Athens//Umrzeć w Atenach, will be presented (passive voice!) at Fabryka Sztuki (ul. Tymienieckiego 3) in Łódź on Sunday, December 2nd at 5 pm. Free admission. Details and Facebook event here. If you want to join the Greek chorus, show up from 12-4 to rehearse with us. Chór jest (as always) otwarty dla wszystkich. 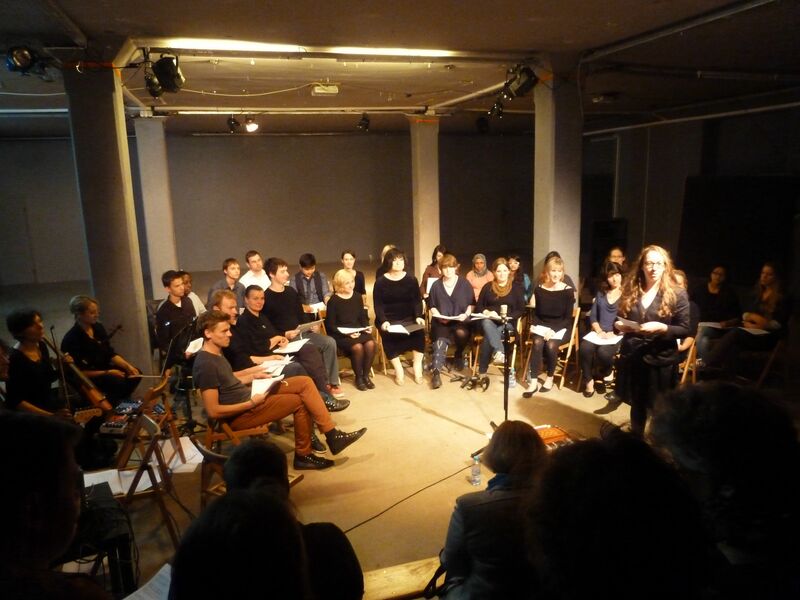 Picture from a reading of TDIA/UWA last June at Komuna//Warszawa.